Funeral sprays are a beautiful and classic funeral tribute but if you’ve not had to choose one before, doing so can feel like a difficult choice to make. Luckily at Handy Flowers, we have created funeral sheaves and sprays of all kinds in our time, so can help you pick the perfect tribute for the special person you are honouring. Our displays are handcrafted by expert florists and can be customised according to your needs. With different sizes, designs and flowers available, whatever you want is available here. Speak to our team on 020 3409 3030 for advice and ideas and we’ll get started on creating the ideal spray. 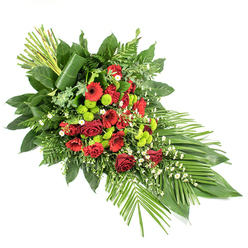 We will arrange the flower delivery on your behalf! Planning a funeral is never an easy time, there is a great deal to plan, and while some people find this comforting during bereavement, we also know that it can be incredibly stressful too. 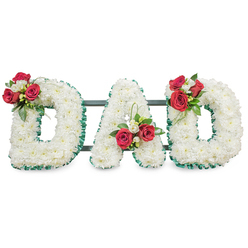 At Handy Flowers our mission is to help take the stress out of funeral flowers for you. So when you come to us for advice on the right funeral spray for your loved one, we will be with you every step of the way to help you explore the options, pick the perfect design, and of course, create it and send it to the funeral home for you. You can be as involved as you wish or leave it in the hands of our capable florists. Did your loved one have a favourite flower? Or a favourite colour? If so, we can design a funeral spray that is personalised to what they liked. People often don’t realise just how many options there are for funeral sprays, so we are here to help you understand what’s available, and support you in choosing the perfect option. Something that truly honours that person who has been sadly taken from you. So whether you’re ready to order your casket spray or just want some advice, speak to a florist on our team by calling us today. 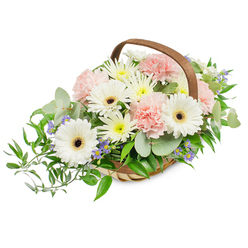 On top of organising funeral flowers to pay tribute to someone who’s passed away, we know that another concern for many of our customers is how to organise funeral flower delivery. We are able to take that stress away from you. Our reliable courier service will make sure that you can have funeral flowers delivered on time, wherever you need them. We are experts in the transport and delivery of funeral flowers, so speak to our team about your funeral flower delivery needs on 020 3409 3030 and get the expert service you deserve. Whether you need to send funeral flowers locally or further away, our team at Handy Flowers is always here to help. We can organise the delivery of your funeral flowers in any London address that you need. 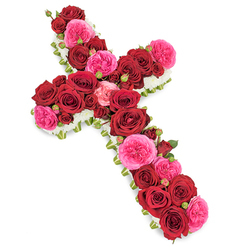 Our mission is to reduce any stress you may experience when ordering funeral flower delivery. Give us a call on 020 3409 3030 to discuss your delivery needs! When you have questions about funeral sprays, or any other kinds of funeral flowers, or even just the process of planning a funeral in general, our expert florists are always on hand to answer your questions and offer the support you need. We understand that you may have questions about the type of flowers for your loved one’s funeral service, so whether you have ordered a funeral sheave with us yet, or just want to get some advice, our team of professionals florists are always available and happy to help. Give us a call on 020 3409 3030 today! 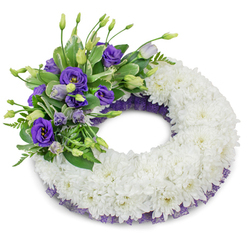 Flowers have long been the chosen way to pay tribute to someone who has died, and while there are many options, a funeral sheave is one of the most classic and stunning ways to do it. Placed on top of the casket, they are a symbol of everlasting life in many religions and cultures. And even if you don’t personally believe in their meaning, funeral sheaves remain a wonderful way to remind those attending the service of the life and beauty of the person being honoured. 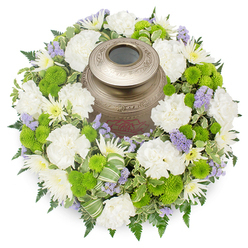 If you believe a sheave would be a good tribute for your loved one, our florist team can help you choose the perfect design. If you need to send funeral sprays ahead of the service, our team are here to help. Not only can they create a personalised and high-quality funeral spray for your loved one, but we can also send them to the funeral home for you, using a reliable and efficient courier service that deals in funeral flower delivery every day. This way you can trust that your flowers will arrive on time, and be of the best condition for the day of celebration and remembrance. 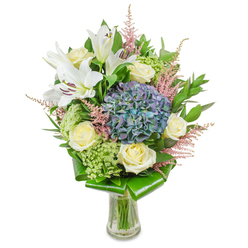 Order from the experts when you visit our flower shop online or call us today!